The ABRF is equipped with Bruker's latest MALDI ToF/ToF, the UltrafleXtreme, which combines ultra high resolution and mass accuracy with high speed acquisition to give fast and reliable results. New Smartbeam™ laser technology has a repetition speed of up to 1kHz for ultra-fast acquisition in both MS and MS/MS modes and has the ability to focus down to 10µm in diameter for MALDI imaging. The basic layout of the UltrafleXtreme involves a MALDI source, the drift region comprising of Precursor Ion Selector (PCIS), LIFT region, Post Lift Metastable Suppressor (PLMS) and both a Linear and Reflector detection system. The PCIS is capable of high resolution selection of parent and associated fragments out of a digest mixture. The advanced ToF/ToF, MS/MS module provides highly sensitive and detailed protein identification using Bruker's LIFT™ ion optics. During ToF-MS the LIFT™ system is removed from the flight path to allow maximum sensitivity and resolution (> 40,000 FWHM in Reflector Positive in MS mode) and is then lowered into place behind the PCIS. LIFT allows the simultaneous detection of both the parent and fragment ions within a single scan by raising the kinetic energies of the parent and fragments such that difference between the parent and smallest fragment does not exceed 30%. This allows the reflector to focus the parent and fragment ions such that they are detected simultaneously at the reflector detector. NALDI target (Nanostructured Laser Desorption Ionisation) for matrix free laser desorption ionisation of low mass organic molecules. 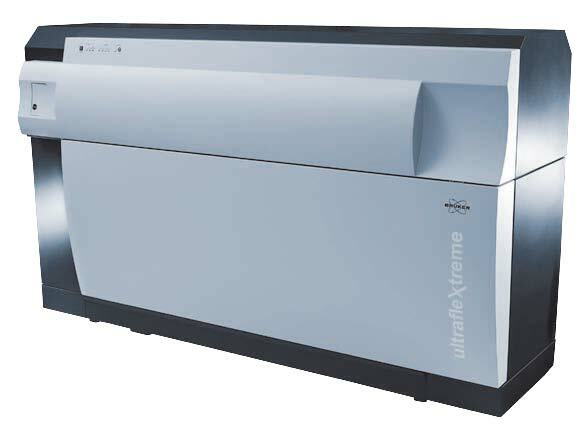 The ABRF's UltrafleXtreme is complimented with a Bruker Proteineerfc robot for LC-MALDI which deposits post nano-LC separated peptides onto MALDI targets for offline MS and MS/MS analysis. Correct sample preparation is essential for efficient analysis of the ToF/ToF, please contact Nathan Smith via email for the SOP for this technique.